This story is part of special IPS coverage of World Humanitarian Day on August 19. 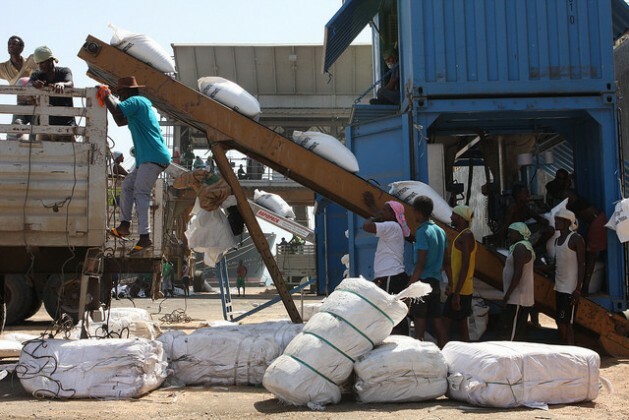 DJIBOUTI CITY, Aug 15 2016 (IPS) - Bags of wheat speed down multiple conveyor belts to be heaved onto trucks lined up during the middle of a blisteringly hot afternoon beside the busy docks of Djibouti Port. Once loaded, the trucks set off westward toward Ethiopia carrying food aid to help with its worst drought for decades. With crop failures ranging from 50 to 90 percent in parts of the country, Ethiopia, sub-Saharan Africa’s biggest wheat consumer, was forced to seek international tenders and drastically increase wheat purchases to tackle food shortages effecting at least 10 million people. This resulted in extra ships coming to the already busy port city of Djibouti, and despite the hive of activity and efforts of multitudes of workers, the ships aren’t being unloaded fast enough. The result: a bottleneck with ships stuck out in the bay unable to berth to unload. Since mid-June until this month, Ethiopian farmers have been planting crops for the main cropping season that begins in September. At the same time, the United Nations’ Food and Agriculture Organization has been working with the Ethiopian government to help farmers sow their fields and prevent drought-hit areas of the country from falling deeper into hunger and food insecurity. Spring rains that arrived earlier this year, coupled with ongoing summer rains, should increase the chances of more successful harvests, but that doesn’t reduce the need for food aid now—and into the future, at least for the short term. As of the middle of July, 12 ships remained at anchorage outside Djibouti Port waiting to unload about 476,750 metric tonnes of wheat—down from 16 ships similarly loaded at the end of June—according to information on the port’s website. At the same time, four ships had managed to dock carrying about 83,000 metric tonnes of wheat, barley and sorghum. “The bottleneck is not because of the port but the inland transportation—there aren’t enough trucks for the aid, the fertilizer and the usual commercial cargo,” Aboubaker says. It’s estimated that 1,500 trucks a day leave Djibouti for Ethiopia and that there will be 8,000 a day by 2020 as Ethiopia tries to address the shortage. But so many additional trucks—an inefficient and environmentally damaging means of transport—might not be needed, Aboubaker says, if customs procedures could be sped up on the Ethiopian side so it doesn’t take current trucks 10 days to complete a 48-hour journey from Djibouti to Addis Ababa to make deliveries. And even once ships have berthed, there still remains the challenge of unloading them, a process that can take up to 40 days, according to aid agencies assisting with Ethiopia’s drought. The port’s 24-hour system of three eight-hour shifts mitigates some of the travails for those working outside, beyond the salvation of air conditioning—though not entirely. To help get food aid away to where it is needed and relieve pressure on the port, a new 756 km railway running between Djibouti and Ethiopia was brought into service early in November 2015—it still isn’t actually commissioned—with a daily train that can carry about 2,000 tonnes, Aboubaker says. Capacity will increase further once the railway is fully commissioned this September and becomes electrified, allowing five trains to run carrying about 3,500 tonnes each. Djibouti also has three new ports scheduled to open in the second half of the year—allowing more ships to dock—while the one at Tadjoura will have another railway line going westward to Bahir Dar in Ethiopia. This, Aboubaker explains, should connect with the railway line currently under construction in Ethiopia running south to north to connect the cities of Awash and Mekele, further improving transport and distribution options in Ethiopia. “Once the trains are running in September we hope to clear the backlog of vessels within three months,” Aboubaker says. The jam at the port has highlighted for Ethiopia—not that it needs reminding—its dependency on Djibouti. Already about 90 percent of Ethiopia’s trade goes through Djibouti. In 2005 this amounted to two million tonnes and now stands at 11 million tonnes. During the next three years it is set to increase to 15 million tonnes. Hence Ethiopia has long been looking to diversify its options, strengthening bilateral relations with Somaliland through various Memorandum Of Understandings (MOU) during the past couple of years. 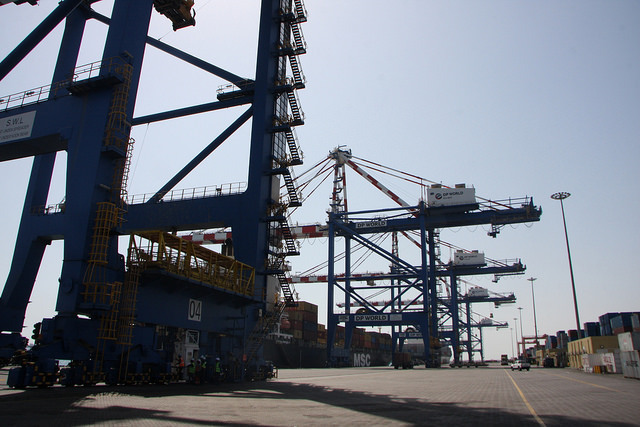 The most recent of these stipulated about 30 percent of Ethiopia’s imports shifting to Berbera Port, which this May saw Dubai-based DP World awarded the concession to manage and expand the underused and underdeveloped port for 30 years, a project valued at about $442 million and which could transform Berbera into another major Horn of Africa trade hub. But such is Ethiopia’s growth—both in terms of economy and population; its current population of around 100 million is set to reach 130 million by 2025, according to the United Nations—that some say it’s going to need all the ports it can get. 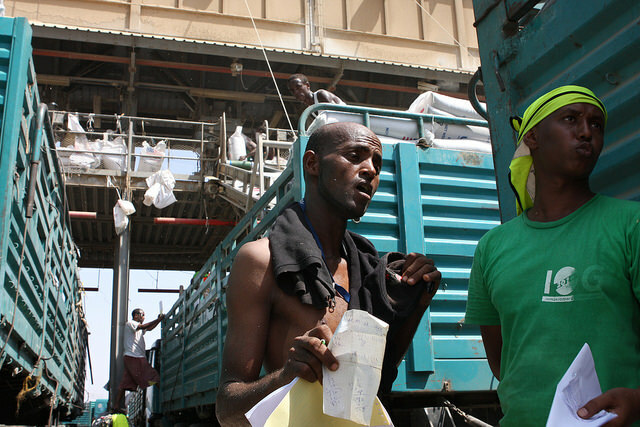 “Ethiopia’s rate of development means Djibouti can’t satisfy demand, and even if Berbera is used, Ethiopia will also need [ports in] Mogadishu and Kismayo in the long run, and Port Sudan,” says Ali Toubeh, a Djiboutian entrepreneur whose container company is based in Djibouti’s free trade zone. Meanwhile as night descends on Djibouti City, arc lights dotted across the port are turned on, continuing to blaze away as offloading continues and throughout the night loaded Ethiopian trucks set out into the hot darkness. Can’t the international donors ship the aid using alternative ports in the area? Forget about politics if one wants to get aid to the needy in time and save life! I did not know Ethiopia was a landlocked country. It seems natural to use Eritreea as an option but there seems to be bad blood between them to not use their ports. Shame.